Scootered down to Brookside on my Scrambler last Sunday afternoon- Triumph Scrambler that is- to the autumn vintage motorcycle show at Brookside Motorcycle Company. Whilst standing around looking at bikes, eating barbecue and shooting the breeze, the conversation turned, naturally, to the good old days. And, as this year there were quite a few mini bikes and bicycles at the show, we started talking about first minibikes/motorcycles, riding bicycles and other happy childhood memory stuff. Anyway, go karts came up and David mentioned that Kartville was originally located on Peoria, just about 3 or 4 blocks from where we were standing. Well...this was news to me and was obviously before my time, [yes, there actually were internal combustion engines and roads and things before me...] so I began to try and research it a bit. 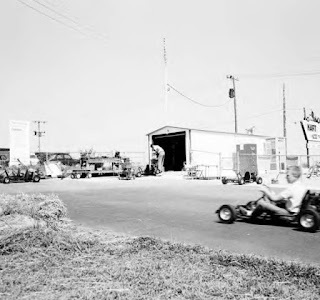 I only remembered Kartville on 15th and Sheridan and then 41st between Mingo and Memorial. The internet didn't provide much help itself, but once again, Wilson's Great Uncle, Beryl Ford, came through courtesy of the Tulsa City-County Library Digital Photo Collection with some great images. These photos are all labelled "Go Kart race track 4300 S Peoria August 10, 1960 "
See - Coke machine and concrete here. Compare to the 3rd picture. No buildings visible in the background here either. Obviously this one is KartVille, but again, notice the background and apparent relief of the land. That's a 59 Chevy there next to the building, and I believe a 60 model parked next to it behind the fence as well as I can tell on my tiny, aged monitor, so the date could be accurate. But is this 43rd & Peoria? This appears to be an overcast day also as the others all appear to be shot in the bright Oklahoma sun. Oh, and notice the building behind the garage/shed now. So... it would appear that these must be mislabeled and are not all taken at Kartville on the same date, or even in the same location. But when and where? Anyway, this is what the area looks like today. Are the other images at 15th and Sheridan? Or maybe 41st Street? I'm not sure ; opinions, anecdotes and photographs are heartily solicited. There are still parts of the track visible, if you know where to look, at the 15th street location. Most of it has been covered and forms the east parking lot and loading dock area for Thermal Specialties. But behind a fence in an overgrown area to the rear of the building, glimpses of the old tarmac are visible. Parts of the track including a short chute and a bit of a curve are still visible. What appears to be the pit area/staging lane is to the West I believe. Essentially, the back lot of Hahn Appliances, which was a large Payless Cashaways lumber yard/home improvement store in an earlier life. So, if you dear reader, have anything to add, any opinions or verification on locations, and especially photos or memories to share, please feel free to do so. Just use the address listed in the 'Contact' section or the comments box below - would love to hear from you. And if anyone knows the whereabouts of that KartVille sign, please advise. 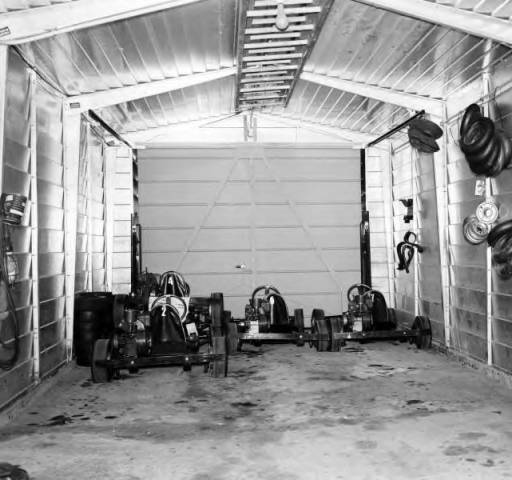 Would love to have that for the garage if its for sale! 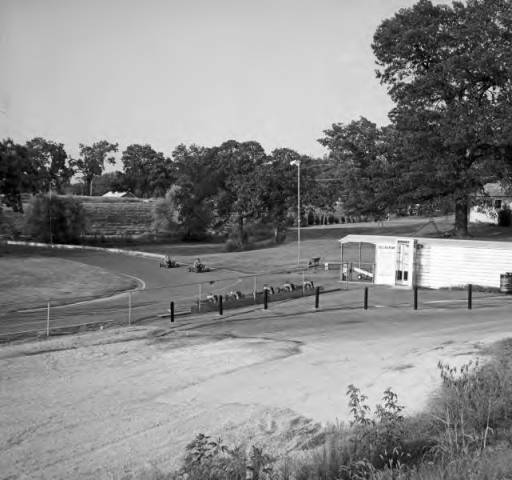 So, there were at least three kart tracks in ’60. Like you, I wonder if the 8 photos labeled with “kart” (D7084, D7083, D7082, D7081, D7080, D7079, D7078, D7077) were taken at different locations. Sheri says "D7077, with the Red Bud clearly in the background, must be of Dizzyland". So, the first picture is of an entity known as Dizzyland. Interesting name - wonder if its merely a play on 'Disneyland' , if they were intimating that the karts were so fast that going round and round the track would make one dizzy, or, if maybe 'Spin Dizzies' were, or had been, raced at that location? 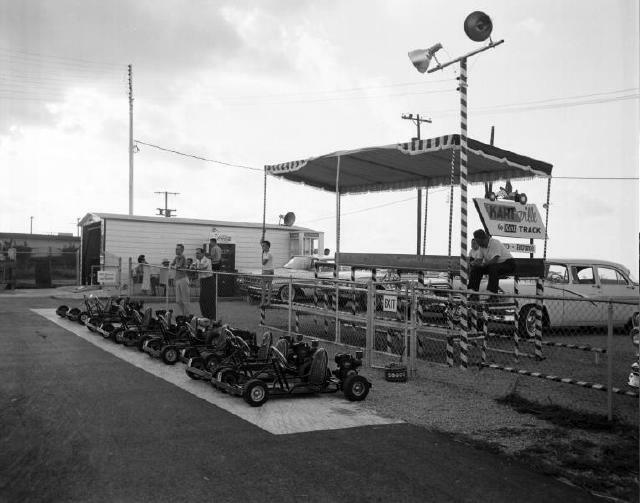 This would also seem to suggest that Driller is also correct in that by the time he had his driver's license and was cruising the area, the kart track was no longer there. The next pictures have been verified as being KartVille on 15th near Sheridan. This last photo is apparently of an establishment known as Kart O Rama. Love that name. Sheri notes that the nearest address listed in the 61 directory is for the Admiral Twin. According to the addresses proper, Kart O Rama would have been directly across from the Admiral Twin on the south side of Admiral Place. Of course, I244 didn't exist at the time, so one must assume that Kart O Rama is sadly buried under said expressway now. But, even with all the changes in the area, the topography in the photo can still be 'seen', sorta, in the area listed. At least as I remember it. But, as YrHmblHst is committed to Truth [as well as Justice etc] and Accuracy, he dispatched a local operative to check it out. 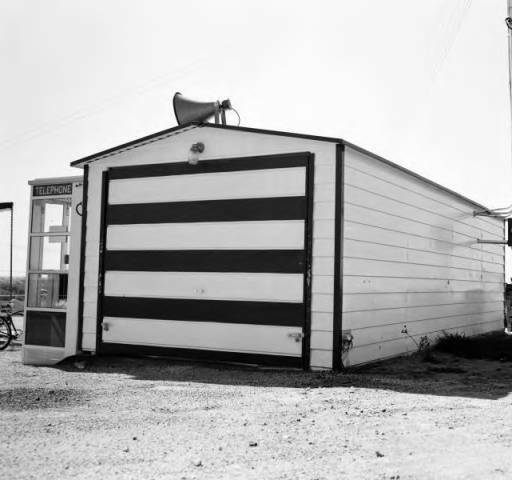 [Thanx David] Now, Dave's memory may not be perfect, but his eyesight is still darn good, and David states that indeed, the photo above could very well have been taken at the location listed for Kart O Rama in the City Directory, as the topography is similar even today. 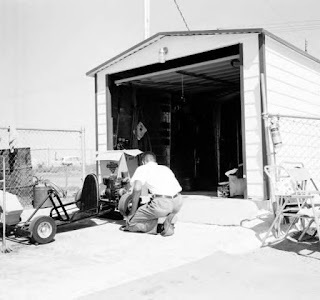 [minus 244 and attendant drainage/runoff areas and such] So, the preponderance of evidence would allow a prudent individual to state with reasonable certainty that this was indeed Kart O Rama circa 1960. RestlessRibbon.com declares it so until proven otherwise! "Thank You" seems a somewhat inadequate expression to convey my appreciation to Sheri for her interest and diligence, but that's the best I've got right now. Thanks so much for the help and commentary. And remember dear reader to support your local library! Thanks for stopping by Driller's Place. 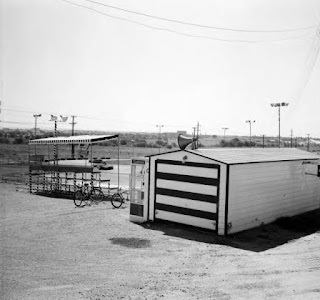 I have to believe that only the first photo is at 43rd and Peoria, and even that is suspect because that would put Kartville directly across the street from Pennington's Drive-In. I truly don't remember a go kart track in that location, even though the Redbud Foods is an iconic structure. 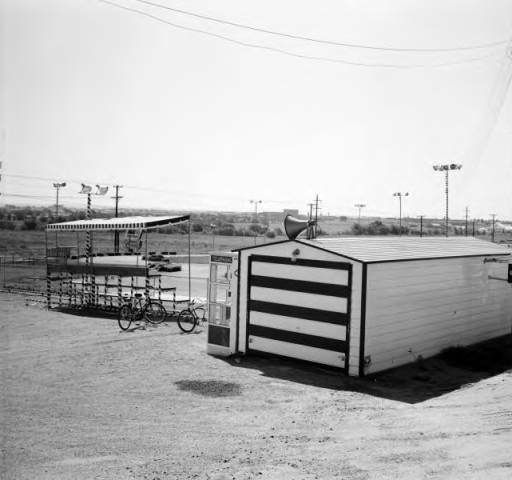 By the early/mid-sixties Peoria was relatively well developed all the way to 51st. Once you crossed I-44 you were in the country. I think these photos are at other locations. There are no rolling hills around Peoria at that location because you're on the Arkansas River flood plain. I agree. 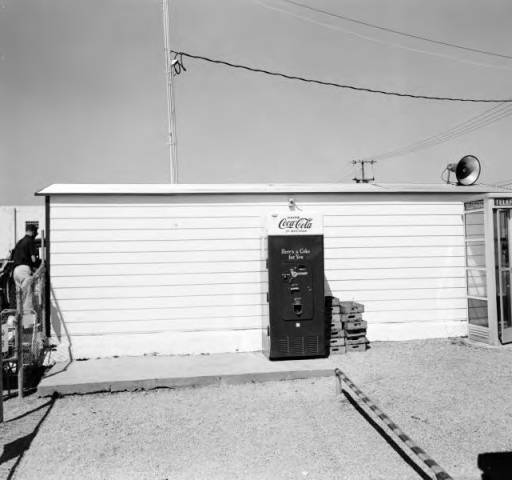 I think the second, fifth and sixth picture are at the 15th and Sheridan location. And MAYBE the fourth one - can't really tell. It could be at 41st Street. But that 3rd one...There is some 'relief' in the landscape there at 15th and Sheridan, but where is 15th St in the photo if at that place? There is also a 'draw' - or at least used to be before all the concrete and 'storm water management' in the area - south of 41st there between Memorial and Mingo, but the rest of the photo doesn't look right for that locale. 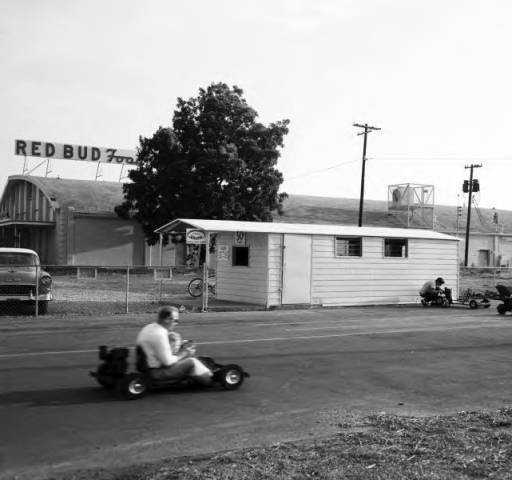 So I'm not even convinced that photo is of KartVille in Tulsa! Be that as it may, you are certainly correct that these are not all from 43rd and Peoria, nor on the same day, as labelled by the Library. Thanks again for your comments and for checking in at the Restless Ribbon. Seems like I remember a kart track on Peoria in the early 70s. It was by a Putt Putt course south of 61st I think. West side of the street as I recall. Don't think it was a "KartVille" , but I remember they had a few bleachers for watching the racers. Anybody else remember that or know the name?